Dark walls are starting to make a comeback, and this makeover is a striking example. AFTER: A grasscloth wall covering, plush rug and a four-poster bed with a customized headboard help turn an ordinary bedroom into a retreat. Sophisticated and bold. Casual and approachable. 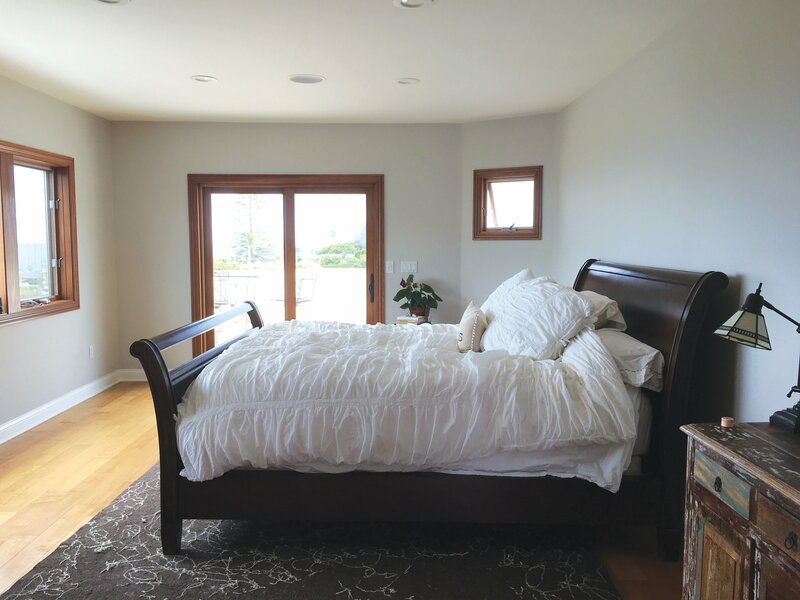 Those are the adjectives these homeowners used when they asked designer Corine Maggio of CM Natural Designs to transform their tired master bedroom. When Corine brought in an almost midnight-like blue and used it against a stark, pure white, drama made its entrance, elegance took its cue and easygoing and welcoming took a bow. 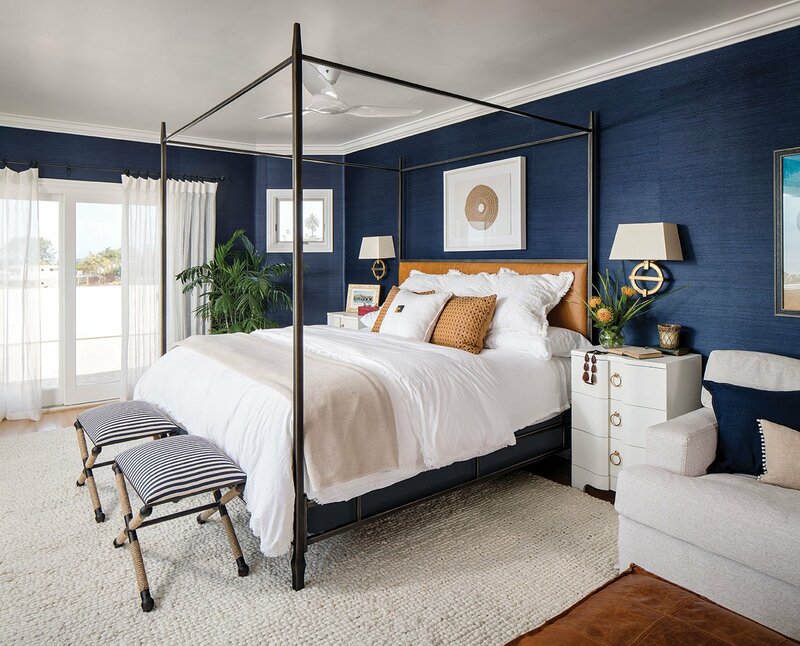 “Most of my clients’ inspiration images had some form of blue and they also had high contrast, so I used the deep blue Seabrook wallpaper as the backdrop and as a contrast with the other pieces of the room,” Corine says. The blue also evokes a sense of coastal living appropriate to the Solana Beach home’s location. “Across from the bed is a lovely ocean view and the dark walls really frame the scene beautifully and make it pop out even more,” Corine says. To give the wallpaper a nicer finishing point, Corine installed crown molding and painted that trim, along with existing molding, a crisp white. A camel-colored leather headboard and pillows complete the look by adding a natural element and texture as well as visual depth. Looking to add dark wall coloring, whether wallpaper or paint, to your room? “Dark walls work best in a room that gets a lot of light,” designer Corine Maggio says. Here are a few of her other suggestions—and a warning—for a dark-walled space. 1. Add a balance of lighter or medium tones to the room. 2. Get multiple different samples and test them in the daytime and at night. 3. Flat finishes will eat up every ounce of light. 4. Semi-gloss paint offers more reflective qualities, which may be needed at night. 5. Don’t be afraid to go dark, but if you need reassurance, consult a designer.